Those of you who read the PhoneArena Awards listing the Best Phablets for 2014 might have been surprised to see the inclusion on the list of the Huawei Ascend Mate7. Does Huawei have a sequel in the works? It certainly would seem so! A leaked photo that was published on Monday is said to show the manufacturer's follow-up device to its highly regarded phablet. The device appears to have extremely thin side bezels and the bezel at the top of the phone is also rather svelte. The speaker grill on the botom rear of the unnamed device runs nearly the entire width of the phone, as opposed to the smaller speaker on the rear of the Ascend Mate7. Details are quite sketchy, and there is no clue as to whether this device would be a refresh version of the Ascend Mate7, or a completely revised Huawei Ascend Mate8. The Huawei Ascend Mate7 features a 6-inch screen with resolution of 1080 x 1920. Huawei is eating its own home cooking by employing its own octa-core 1.8GHz HiSilicon Kirin 925 CPU, which uses the big.LITTLE architecture. Variants of the phone with 3GB or 2GB of RAM are available. The version with the larger amount of RAM features 32GB of native storage, while the other model comes with 16GB of the sweet stuff. If you need more memory, a 128GB capacity microSD slot is available. The 13MP snapper on back has an aperture of f/2.0 to help you take great pictures under low-light conditions. The front-facing camera is a 5MP "selfie" snapper. A massive 4100mAh battery keeps the lights on, and Android 4.4 is pre-installed. Now that you know what the fuss is all about, you can see how hard pressed Huawei will be to make a sequel to the Ascend Mate7 that will capture as much attention as the current model. But that doesn't mean that Huawei won't try. 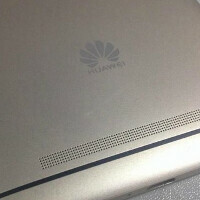 Has a sequel for the Huawei Ascend Mate7 leaked? Fake spy shot in a bus? If it didn't had the speaker grill in the back i could easily mistake it for an M8. Mate7 compact or mini version. 6 inches phablet is not for me. ***Shrieks! *** Lets have 6 inch QHD, 2 Ghz Octa-Core, 4 GB RAM, 4,500 mAH battery, 20 MP camera, and even slimmer bezels than before!!!! !